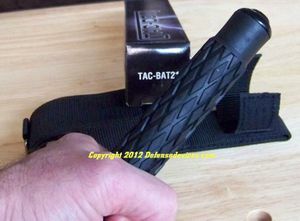 These Tac-Com retractable batons are made by the same company that makes the Smith & Wesson batons. They are heat treated and law enforcement grade. These telescopic batons expand to 21 inches for duty and retract to just 8 inches for carry. Each baton is designed with heat treated 4130 steel and a diamond pattern rubber grip. A heavy duty ballistic nylon holster with tie down ring is included. Each holster can accommodate duty belts to 2.5 inches wide. Cannot ship to NY, MA and CA.